Today is World Alzheimer's Day, and I want to honor a very special person in my life who is suffering from this awful, soul destroying disease, that affects not just the person who is diagnosed with it, but the entire family who loves them. That person is my father, seen here with my dog, Benny, someone who can still bring him joy and comfort just by showing up. I was in therapy myself when I first started worrying about Dad. His side of the family has a strong family history of Alzheimer's, or dementia or whatever you want to call it. My grandma Mollie had it, her mother Clara had it, her brother, my great uncle had it. Back in 2005 or 2006, I started noticing that my father, who was extremely eloquent and never at a loss for words, suddenly was. Our conversations during those years under President Bush were usually about politics. Dad was a lifelong Republican and I'm a "recovered Republican" - or what critics of my political columns call variously "an America-hating communist, a socialist, a terrorist -lover" or my all-time favorite, someone who is "using the American way of life to destroy the American way of life and the rest of Western Civilization in the process!" But I noticed during those conversations - which inevitably devolved into arguments - that Dad would suddenly pause and struggle to think of a word - a word that normally would have tripped off his tongue easily. The kind of vocabulary that someone with his background in government would have to hand as easily as we writers would have manuscript or revise or adjective. And given the family history, it scared me. It's hard to talk about this stuff though, to the person and to other people in the family. "Uh, hey guys, I think Dad's losing it." I was fortunate that I was in therapy, because I could talk it through with my therapist, and she was able to tell me something very important - that if we got Dad on some drugs like Aricept early enough, it might prolong the onset of the more serious cognitive decline. She also gave me the name of someone at Greenwich Hospital who specialized in elder issues, who my parents could go and see. It was that knowledge that gave me the courage to mention my concerns to first my brother, then my mom, and finally Dad. I took him out to lunch at the Bulls Head Diner, and told him that I was worried about him. And he admitted that he was worried about himself. It turns out that everyone was worried, but no one wanted to worry anyone else. We were all living on own little islands of anxiety, until finally one of us swam across the sea and brought it out into the open. The thing about bringing the worry into the open is that you can DO something about it. While there's no cure for Alzheimer's, I'm convinced that getting Dad on those drugs early slowed his decline, giving us a few more years, particularly precious for my kids so that they can remember Grandpa (or "Grandpoo", as he's affectionately known) more as he was than as he is now. Towards the end of last year, however, the decline started to accelerate. We had to deal with the very painful issue of his driving, which I talked about in a column here. Understandably, he was upset and angry about having his license taken away. He still talks about it sometimes. Earlier this year, there was another marked decline - this time involving a personality change and violence. The day we'd been dreading, but thanks to my brother's foresight, he and I had been planning for financially for over a decade, arrived - when we had to make the incredibly difficult decision to move Dad to assisted living. I remember visiting my Grandma Mollie when she was in a nursing home, and it was so awful and depressing - I couldn't bear the thought of Dad being in a place like that. But we found somewhere that is different - for what it is, it is wonderful. The rooms are light and sunny and there are always activities going on. Dad had been going there for outpatient adult day care for a few months, so he was already familiar with it. But still...it's not home. And he might be out of it, but he still knows that. A week or so ago, the awful Pat Robertson said yet another awful thing, for which I will never, ever forgive him: Divorce your spouse with Alzheimer's. It made me furious beyond measure, and to me, is yet another example of how sometimes (not all the time) those who follow the letter of the Bible's laws completely miss the spirit, and end up being some of the most godless, least compassionate people on the planet. Last Friday afternoon they had a Dog Show for all the residents where Dad lives. 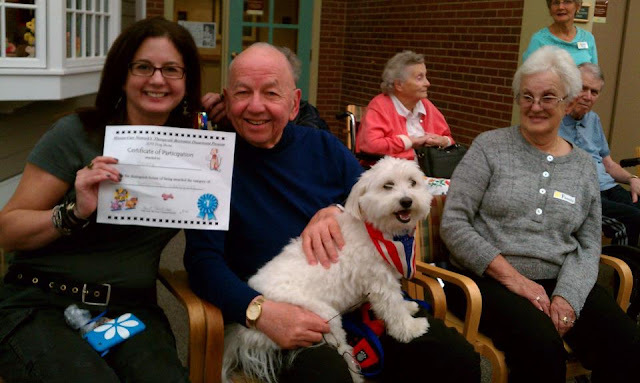 Although Benny isn't an "official" therapy dog, he certainly brings joy to Dad's life and a smile to the faces of all the other residents he encounters. I brought him for the dog show and he won "Waggiest Tail". Dad was VERY proud. Right after we took this picture, they had a singalong of Patriotic songs in honor of Constitution Day. My dad spent decades working for the US government, and he served in town government when I was growing up as a Republican. He is one patriotic dude, let me tell you. He used to know every word of every patriotic song there is. When we started singing, he was proud - so proud that he had tears in his eyes, and saluted every few bars. But HE COULDN'T REMEMBER THE WORDS. It made me want to cry, but I didn't want to cry in front of him. But that's what Pat Robertson doesn't understand. My dad is NOT walking dead. He may not remember my name. He doesn't remember my kids' names. He remembers the dog better than he remembers me most of the time. But he's still at his core, who he always was - a patriot and a man who loves his country. And his face lights up every time he sees me. He still loves me. Alzheimer's has just robbed him of his words to express it. I'm grateful to G-d that I still have mine so that I can express my love to him, and that, Pat Robertson is why you are so very wrong. Ten years ago today, I was in Silver Hill Hospital in New Canaan, CT, after taking an overdose of Valium and almost ending my life. I was supposed to have been released the previous Friday, until the psychiatrists realized I'd was doing what I always did - donning The Mask of Coping. They called me on it and so I was still in the hospital, due to be released that afternoon. Just before that nine that morning, I went into the phone booth and called my friend Barbara, who gave massages, because after 10 days in that place, I really need a healing touch. There was a glass door on the booth, and as I was speaking to her, I glanced out and saw the TV in the common room. "Oh my G-d! The World Trade Center is burning!" I said to her. She didn't have a TV, so she couldn't see what was happening. I hung up with her and walked into the common room where a few other people were gathered around the TV. They told me a small plane had flown into the WTC. I don't know if it's because of my father's background in intelligence, but my first thought, the first thing I said was, "It's terrorists." People started arguing with me. They said it was a small plane. The guy must have had a heart attack. Or lost his bearings. I argued back. "It's a clear blue sky. No clouds. How could he lose his bearings?" 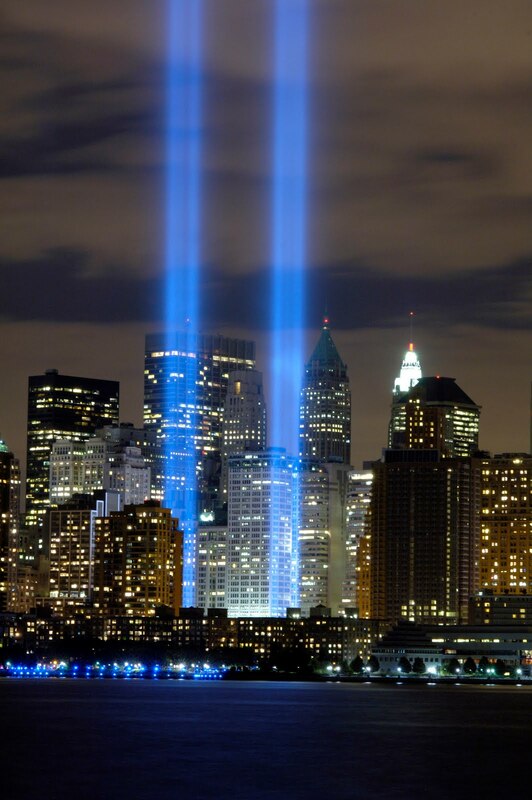 We were still arguing as we watched - horrified, shocked, disbelieving - the second plane hit the South Tower. And then there everyone knew. It wasn't accident. There was no heart attack. No one lost their bearings. It was a deliberate. It was intentional. Then we heard plane hit the Pentagon. It wasn't just a terrorist attack, it was a terrorist attack on a grand scale. One of the women in the hospital with me was there from MA. She wanted, more than anything at that moment, to be with her family, to hold her children close. As she cried, I tried to comfort her, telling her we had to be strong, because if we panicked, if we fell apart, they'd achieved their objective. Kind of ironic coming from someone who was in a mental hospital for, well, falling apart. The Powers That Be at Silver Hill were trying to figure out how to deal with something this enormous and help us deal with it. Although they were experts in the field of mental health, this wasn't something that hadn't been taught in med school. They called us into a meeting where they discussed limiting our access to the TV, because it was distressing some patients, which only upset and stressed out the news junkies amongst us even more. People cope with stress differently. Some want to turn off, wanting some form of escapism. Others need to know more, wanting details, seeking knowledge. Neither one is "right," to each their own. But I'm definitely the latter. In the end, they decided to take us to the gym so we could work off some stress. In the van on the way down there, we heard on the radio that the South Tower collapsed. And that's when my Mask of Coping finally slipped, fell, cracked and broke. Because all I could think of was the people still in that tower. I started crying hysterically and repeating over and over, "All those people, all those people." The same woman who I'd comforted earlier took me in her arms and held me. She repeated back to me the same words I'd said to her earlier. In the gym, I went straight for the heavy bag, pretending it was the faceless enemies who'd flown the planes, punching it over and over until I was sweaty and breathless. I'd just started on the treadmill when I heard the North Tower fell. Later, one of the male nurses, or "techs" as they called them, walked those of us who wanted to pray over to the non-denominational chapel. He turned to me and said, with no small amount of anger in his voice, "You tried to kill yourself - but would you change places with anyone in those buildings?" It's a question that gutted me then and has haunted me ever since. What drove me to take those pills was the thought on that different awful day in 2001, August 28th, was that my life was a long, dark tunnel with no light of hope at the end, and that most of all, my kids would be better off without me. I know better now. I'm grateful to G-d, to my family, to my friends and my therapists for the fact that I was given a second chance, one that those in the buildings and on the planes didn't have. I'm blessed that I've lived to see my children grow up to be the wonderful, bright, kind, empathetic, loving, thinking human beings that they are. When I listened to the young people at the 9/11 memorial event this morning talking about the things they missed about their parents it made me weep, but it also made me realize how very ill I was to think my kids would be better off. It took four hours this morning to read the names of the all the victims. As I heard each name and saw each picture, I thought of the complex web of lives behind them that have spent the last 10 years trying to rebuild their lives from loss, or as one relative put it, living without "the missing puzzle piece in our family." Edited to add: I'm reminded of lines from Psalm 126 that gave me so much comfort while I was in the hospital: “Those who sow in tears shall reap with songs of joy.” Ten years later, that has certainly been the case for me. "To the world he was just one person, but to me he was the world."